The challenge facing the Omsk factory is how to get its output onto the international market. Three weapons exhibitions held in Omsk produced minor results. But after participation in international displays in Adu Dabi in the Arab Emirates, Geneva, Cairo, Le Bourget in France and Farnborough in England the T-80U tank captured contracts from number of countries. 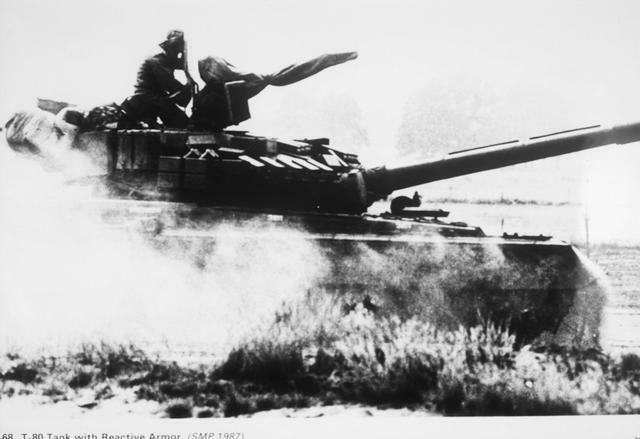 As of late 1997 the well-publicized sale of 320 Ukrainian T-80UD MBTs to Pakistan appeared to be dead in the water. A total of only 35 T-80UDs had been delivered to Pakistan in two separate batches in March and May 1997. These 35 tanks were reportedly drawn from Ukrainian Army stocks and had capabilities below the level agreed to by the two countries. According to Moscow's Kommersant Daily, this apparently caused the Pakistani government to cancel the sale. The Russian government has been publicly against this sale from the very beginning, and has repeatedly refused to supply Ukraine with critical components needed to build the T-80UDs. 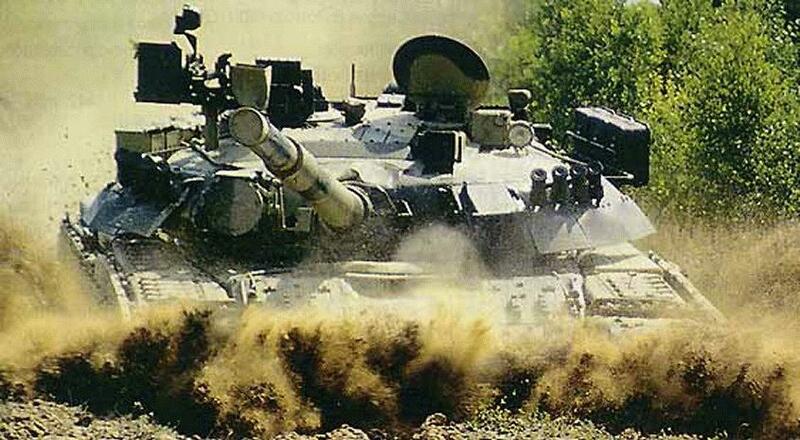 While the more modern Ukrainian T-84 MBT is �80% Ukrainian-made,� the T-80UD is a largely Russian product. Pakistan had been assured by Ukraine that the contract for the T-80UDs would be honored in spite of pressure and lack of support from Russia. Without Russian support, its likely that the only T-80UDs to be seen in Pakistan will be those few already paraded through Islamabad. The T-80B and -BV variants are often misidentified as T-80. They are visibly different and bear other distinctions, such as T-80B/-BV capability for launching AT-8/ Songster ATGM. T-80: The first production model of the T-80 entered production in 1978 with only a few hundred built before production switched to the T-80B. T-80B: Sometimes referred to Beryoza (Birch Tree), this first major redesign features a modified turret with new composite K ceramic armor providing better protection against APFSDS kinetic energy penetrators. T-80BK: Command version with additional communications equipment and antennae. T-80BV: Variant has first generation explosive reactive armor [ERA] mounted. This variant is more likely for encounter by US forces. A late production version has a new turret similar to the T-80U but fitted with the turbine engine and first generation ERA. 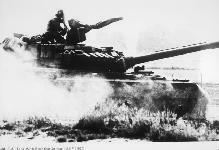 T-80U: First observed in 1989 and referred to by NATO as the SMT (Soviet Medium Tank) M1989. The new turret has an improved frontal armor package with second generation explosive reactive armor. This version is equipped with the 9K120 Svir (AT-11 Sniper) laser-guided anti-tank missile in place of the older Kobra. Other improvements include a more powerful and fuel efficient gas turbine engine (GTD-1250, developing 1250 hp). T-80UD: Version produced in Ukraine with a 1000-hp diesel engine instead of the turbine engine, and 1st generation ERA. In August 1996 Pakistan placed an order for 320 T-80UD MBTs under a deal worth about $580 million, and the first 15 were delivered in February 1997. T-80UK: Command version with R-163-50K and R-163-U radios, TNA-4 land navigation system, and an electronic fuze-setting device that permits use of Ainet Shrapnel Round. The AGAVA thermal sight provides a 2,600-meter night acquisition range. T-80UM: Upgraded with a gunner's thermal sight with additional tank commander viewing screen. 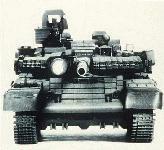 Similar to standard T-80U, but without IR searchlight and with enlarged night sight housing. Outfitted with 2nd Generation ERA. 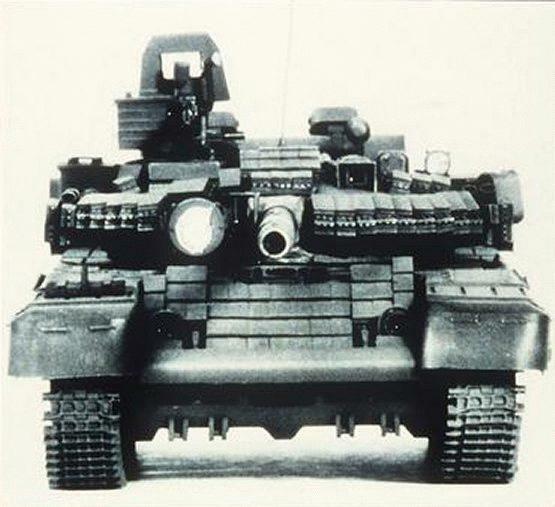 T-80UM1 "Bars" (Snow Leopard) : Prototype with Shtora and Arena defensive systems, though apparently without Kontakt-5 reactive armor tiles on its turret, since the Arena system with fragmentation charge launchers arranged in a semicircle around the turret front may preclude mounting reactive armor. T-80UM2? "Black Eagle" : Features a new turret with highly sloped front and a bustle-mounted autoloader on a standard T-80U hull. Also incoporates a redesigned ammunition storage scheme to reduce vulnerability to ammunition fires. It is unclear whether this is simply a technology testbed demonstrator vehicle, possibly intended mainly for export, or whether it may enter Russian service in stead of the new Uralvagonzavod design. T-84: Recent Ukrainian upgrade of T-80UD with a welded turret, a French ALIS thermal sight, a more powerful engine, optional use of ARENA active protection system (APS) and SHTORA-1 active IR ATGM jammer system. Prototypes have been demonstrated, and the tank is available for export.